LABOUR is staring into the abyss. 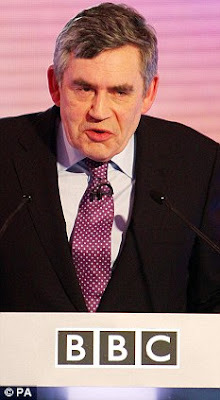 This Thursday it now seems likely that Gordon Brown will suffer the heaviest defeat ever inflicted on a British Prime Minister. According to several of the latest polls, fewer than a quarter of voters back Labour, far behind the Tories and the Liberal Democrats. Never before in the history of Britain has a governing party slid into third place. But a crushing defeat would be no more than Labour deserves. After 13 years of the party’s mismanagement, lies, corruption, dogmatism and bullying, there would be a tremendous sense of justice in a mass expression of revenge by the British people against their arrogant socialist rulers. Labour’s wretched election campaign has been entirely in keeping with their style of governance. All the worst characteristics of the party’s rule have been reflected in its dismal political operation over recent weeks. Mixing authoritarianism with childish propaganda, scaremongering with deceit, Labour has been both relentlessly negative and spectacularly incompetent. It was not meant to be this way. Before the campaign started, Labour loudly boasted of the sophistication of its election machine. In Peter Mandelson and Alastair Campbell, the party was meant to have two of the great political geniuses of modern times. In practice, however, Labour’s campaign has proved as hopelessly dysfunctional as Brown’s own Cabinet. Mandelson and Campbell have behaved like embarrassing bunglers presiding over amateur night at the end of Southend Pier. Weighed down by unprecedented unpopularity, Brown himself has proved a catastrophic figurehead, “pure poison on the doorstep”, in the words of one Labour activist. His sullen, broken appearance on the campaign trail has been like that of a political prisoner, shuffling from one safe house to another to avoid contact with the public. The one occasion that Brown was allowed out to meet real voters ended, all too predictably, in disaster. The fall-out from his encounter with Rochdale pensioner and lifetime Labour supporter Gillian Duffy has been so explosive because it encapsulates everything that is repellent about both the Government and Brown’s own character. In his private condemnation of Mrs Duffy as “a bigoted woman”, we can clearly see Labour’s snobbish contempt for the ordinary, decent, hard-working people of Britain. 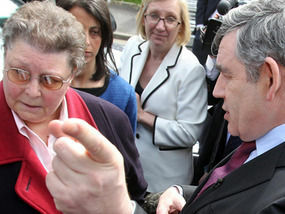 When Mrs Duffy was told by a TV crew of Brown’s offensive comment, she could not believe it. Her jaw literally dropped. Her look of bewilderment at the cruel betrayal symbolised how working-class voters, the backbone of Britain, have been let down by Labour. “The thing is, I’m the sort of person he was meant to look after, not shoot down,” she said yesterday. Those words should serve as an epitaph for Brown’s destructive premiership. Brown’s outburst epitomised the view of the trendy, metropolitan elite, whereby any opposition to uncontrolled immigration is seen as nothing more than racist bigotry. But, insulated by wealth and privilege, the socialist elite do not have to live with the consequences of their policies. While they blather about the joys of diversity and cheap nannies, the likes of Mrs Duffy have to cope with overstretched public services, rising crime and a breakdown in social cohesion. The incident was also deeply revealing of Brown’s own unedifying personality. He was exposed as an arch hypocrite: phoney smiles to her face; foul, misogynistic insults behind her back. His epic self-pity in the aftermath was embarrassing. His supposed “mortification” was because of the damage he had done to Labour’s campaign, not the offence he had caused to Mrs Duffy. But this has been the pattern throughout Labour’s campaign and Brown’s premiership. The party that physically drags hecklers out of election meetings is the same illiberal outfit that tramples on our freedoms, introducing identity cards, employing armies of official snoopers and placing spy cameras in our wheelie bins. Labour’s resort to childish election propaganda, using primary-school-type posters scrawled with messages such as “Don’t Forget to Vote Labour, Mum”, is in keeping with a Government that has tried to infantalise the entire public with lavish welfare benefits and an all-powerful state. Labour's gross dishonesty in the campaign, especially its refusal to be straight about the ruin of public finances, mirrors the Government’s addiction to lies and spin, whether it be over the Iraq war or crime statistics. This is the Prime Minister who promised “an end to boom and bust” and “British jobs for British workers”. As the final days of his premiership approach, he no longer deserves a hearing. Even in the television debates, Brown was misery personified, spouting off his distortions and Soviet-style statistics. The contrast with David Cameron was graphic. After a low-key start to his campaign, the Tory leader has peaked at just the right time. Despite the dire state of Britain’s economy, Cameron has exuded optimism and a sense of purpose. Unlike Brown’s shambolic effort, his campaign has a central theme, that of reducing the role of the state and restoring personal responsibility. Our country is crying out for a fresh start – and Cameron has shown he can provide it. Now that is what I call journalism! That 25% supposed Labour voters will be scroungers and the middle class State clientocrocy who must be fearing the worst as the new Government slashes spending to the bone to repair the damage Brown has done. "sophisticated election machine", oh really? I haven't even had a leaflet from them and, frankly, don't know their candidates name.